On Friday (31 May) we published a new version of the Good Practice Guide (GPG) 45 – Identity Proofing and Verification of an Individual. 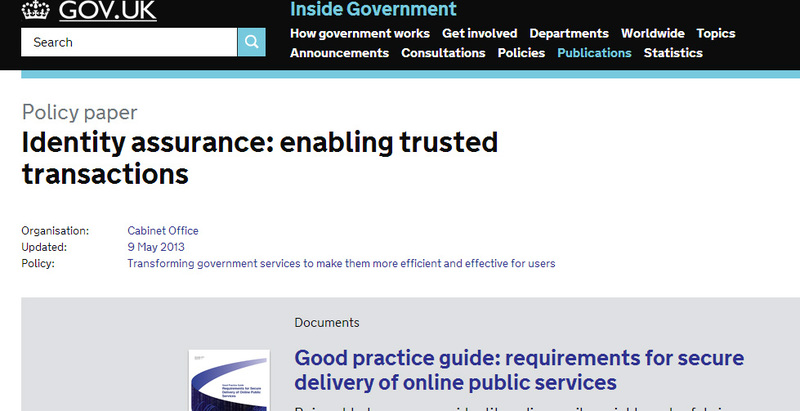 It can be found on the Cabinet Office site together with the full set of previously released guides. This guide sets out the basic requirements for proving an individual's identity and forms the basis for delivering trusted, online government transactions. The update has been produced jointly by government departments, private sector representatives and the UK National Technical Authority for Information Assurance (CESG). This new version describes more clearly the proofing and verification requirements for obtaining an assured digital identity. It also describes a new stage in the process for establishing assurance, based on evidence of activity in the real world for the claimed identity. As always, we welcome your feedback via comments here.